Located in Downtown Montreal on Canadiens Avenue, this 1-bed and 1-bath condo is 550 sq. ft. and features a private balcony, exposed brick wall, floor-to-ceiling fenestration, and a closed bedroom. Exceptional building amenities include rooftop terrace with a swimming pool and an on-site fitness pavilion. 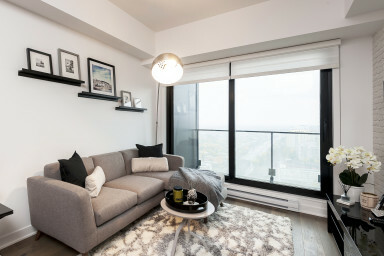 Highlighted by a stunning view of the city, the bright open-concept living space offers a relaxing den area with wall-mounted flat-screen television and a sectional sofa, as well as a linear kitchen equipped with high-end appliances, complete cookware, and central kitchen island. Get your rest in a closed queen-size bedroom, which includes a Juliette balcony overlooking the city below, a spacious walk-in closet, and an en-suite designer bathroom with walk-in rain shower. Unit #1103 also offers a concealed laundry closet, unlimited high-speed Wi-Fi internet, free cable, and local calling for your added convenience. For all your accommodation needs, think Simplissimmo! The magnificent Tour des Canadiens Tower is Montreal’s only 50-storey sports and entertainment condominium, with 552 luxury condos, thirteen levels of private indoor parking, and it’s very own licensed sports bar. Completed in 2016, this unique skyscraper boasts an exceptional lifestyle for its residents thanks to a variety of world-class amenities, including a state-of-the-art fitness pavilion with exercise room, rain spa, sauna, and yoga studio. Enjoy exclusive access to the landscaped rooftop terrace, complete with sun loungers, barbecue stations, and an outdoor swimming pool. A shared penthouse lounge and game room is perfect for entertaining friends and family, and enjoy 24-hour security concierge service, ground-floor shopping, and a direct entrance to the Underground City. With multiple choices of entertainment, shopping, and fine dining options around, spend the day browsing through the endless selection of designer shops on St-Catherine Street, including major shop such as Ogilvy’s, the Eaton Center, and The Hudson’s Bay Company. For dinner, head over to Ristorante DaVinci for fine Italian dining, Queue de Cheval for the finest cuts of steak, or Europea for Chef Jérôme Ferrer’s inventive French plates before catching a Habs game right next door at the Bell Center. To experience some of Montreal’s infamous nightlife, look no further than nearby Crescent Street. Everything you need for an exciting stay right at your doorstep!